Cobras come in different species with a distinct common trait: They're deadly. These creatures strike with ferocity and can bring down opponents hundreds of times their size. Cobras don't have to hunt often, but when they do, the combination of their size and their potent venom makes them a force to be reckoned with. Cobras don't have to eat every day -- in fact, they can go months without a meal. When it's time to feed, though, they rely on their tongues to help them hunt. Cobras aren't deaf, but they aren't able to distinguish ambient noises, and rely on their sense of smell to track down prey. By flicking their tongues in and out, they pull smells into their mouths, where a special organ interprets the smell. Following the scent, the cobra tracks his prey. When a cobra is on the defensive, he often makes his body appear as big as possible to look threatening. The snake can actually stand up relatively straight, with a third of his body standing upright -- for the tallest specimens of king cobras, this can reach 6 feet. He also uses muscles just below his head to fan out a part of his body called the hood. 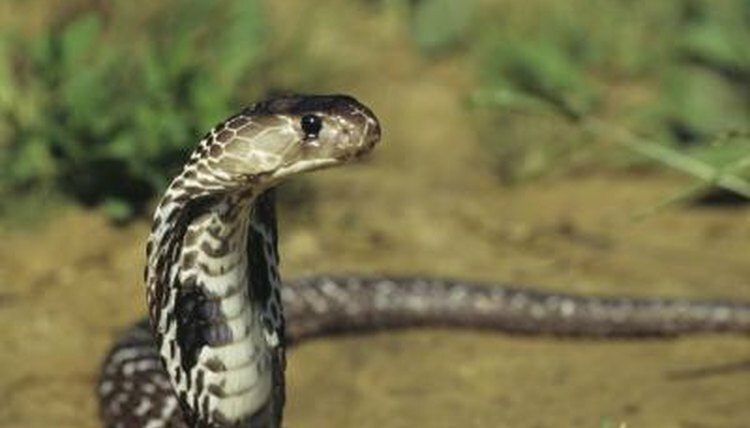 The hood, filled with muscles and ribs, acts as a warning to predators that the snake is a powerful foe. When he's hunting, he doesn't necessarily bother extending his hood, but it's a deterrent against would-be adversaries. Cobras strike hard and fast, and they don't need to do much more than that to bring down their prey. A cobra lunges in with a quick bite, plunging his fangs into his prey and just as quickly snapping back into his original place -- from that point on, the venom does the work. His venom is potent, and his bite delivers an impressive amount -- about 0.2 ounces. In fact, he injects so much venom in a single bite that one strike can take down an elephant. After the venom kills the prey -- typically by stopping the victim's breathing -- the cobra unhinges his jaw and swallows it whole. A cobra's strike is strong, but he doesn't always stop at one bite -- he may strike an opponent several times, injecting unnecessarily large doses of venom into his prey. Some species, known as "spitting cobras," actually squirt venom out of their fangs to attack their prey from a distance of 6 feet or more. When squirted into an adversary's eyes, this venom temporarily or permanently blinds them, and it can actually cause tissue scarring simply from skin contact. Indianapolis Zoo: Snakes: Did You Know?